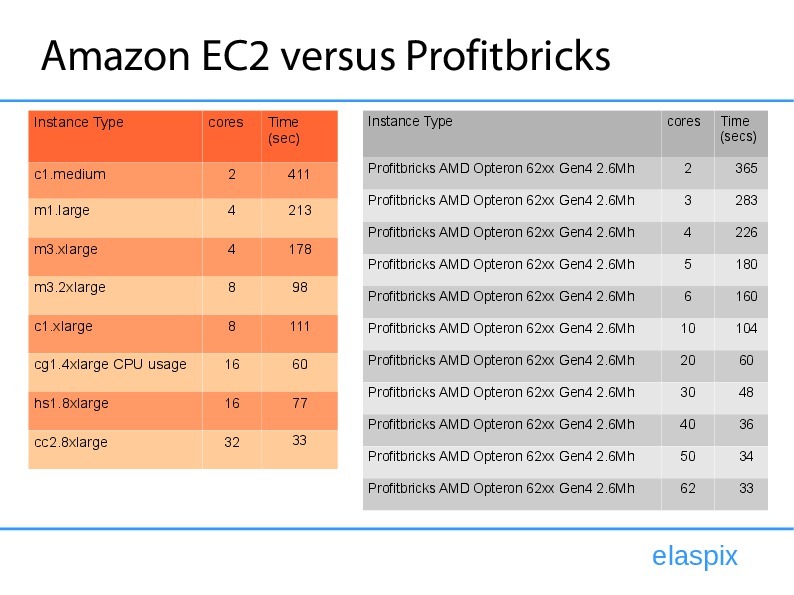 As a render farm is the core of the Elaspix configurator applications, there is a strong interest on the render performance that can be achieved. In order to report meaningful results a reference scene whose render times can be measured and compared is required. 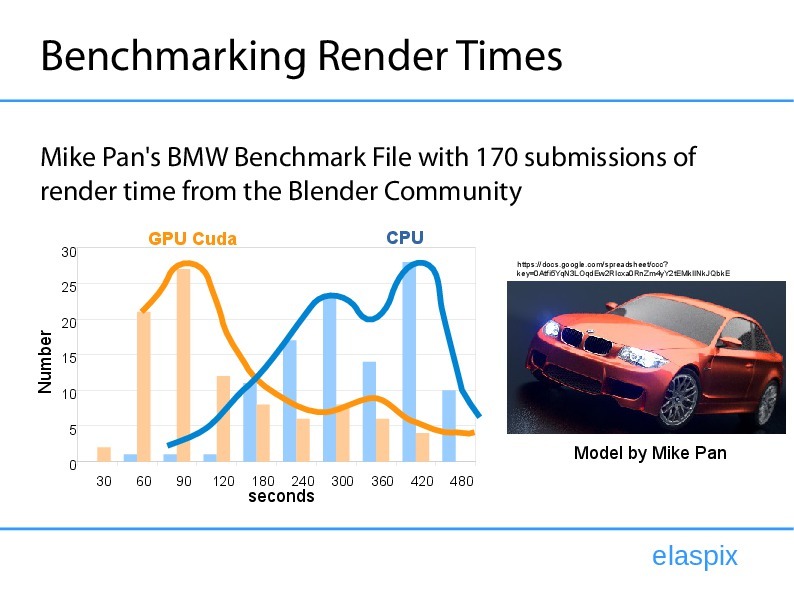 Fortunately, Mike Pan provided the Blender community with such a reference model. More than 170 blender users have published their individual render times already (here’s a more recent version). We at Elaspix compiled a statistical histogram (see below) to overlook those results from a broader perspective. It became obvious that GPUs renders faster (average 175 seconds, median 89 seconds and minimum 20 seconds) than CPUs (average 461 seconds, median 388 seconds and minimum 53 seconds). GPU is so much faster because it distributes the work to many cores in the graphics card. As a matter of fact, it is more expensive to rent a GPU in comparison to rent a CPU. So we have been very curious if we can beat the GPU performance by using a multi-core CPU system. 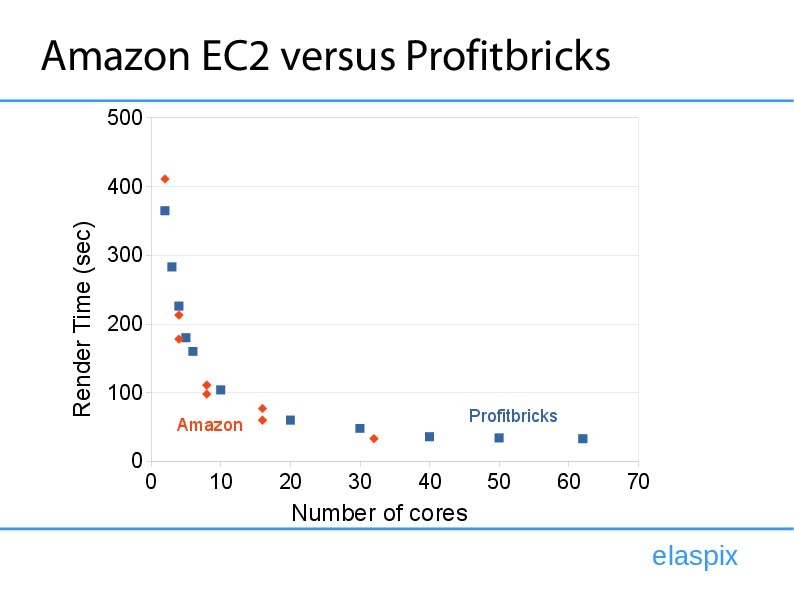 As Elaspix does not own hardware by ourselve with so many cores, we have to rent it from Amazon or its German competitor Profitbricks. Interestingly, there are only two people in Mike Pans’ list that have a faster GPU-based render time than what we could achieve by using a Massive-Multi-Core CPU system (you can find the render times in the table below). Of high interest was as well how adding cores would melt down the render time even further. This dependency is made visible in the chart below which shows that using 2 or 22 cores makes a huge difference of 300 seconds whereas the difference between 40 and 62 cores is just 2 or 3 seconds. We have found a Massive-Multicore-CPU System is almost as fast as the fastest GPU graphics card that a blender user has reported. Furthermore, we see that the render time decreases not linearly with the number of further added cores which is very important for us as we can now better understand how many cores we should rent to find the optimal trade-off between production costs and render performance.